When students feel powerless, learning becomes a tug of war between the teacher and the learner. This doesn’t have to happen. The student/teacher relationship where the teacher’s job is to maintain control and the student’s job is to submit to control is a pervasive characteristic of the traditional school paradigm, and I’d bet all of us have experienced it. Sometimes the exchange is subtle and involves the student feeling at fault for an unfair situation. One episode from my own life that stands out is when I stayed after school with a few other students to get extra help from our trigonometry teacher. It’s important to note that by this time in high school I’d been trained in a hundred different ways to believe that I wasn’t very good at math. Today, this belief has probably become a reality, because at some point I gave up on trying to be good at it, but this wasn’t always true. I was in advanced math classes in elementary school and loved to help my mom figure out the grocery bill before we got up to the register. But by my junior year, I’d gone home crying in frustration enough times to feel like there was definitely something wrong with me, that it wasn’t the teacher’s fault; it was my inability to “get it.” So the fact that I was spending extra time on this class that I believed I was bound to fail was commendable. The teacher put a problem on the board and had us solve it in our notebooks. I asked a lot of questions, even though I was terrified and confused. The last thing I remember, the moment that prompted me to ultimately go to my guidance counselor and ask her to let me drop that class, was when my trig. teacher, tired I’m sure from her own daily challenges, told us we needed to hurry up because she was supposed to meet her daughter at the mall soon. That was it for me, the moment I knew this teacher couldn’t really help me overcome my fear, much less pass her class. Because I believed she held all the power to reverse my ignorance and quell my fear, and because I was convinced that I was at fault for not “getting it” and powerless to help myself, I was at a loss for any better solution than giving up. But sometimes the exchange is more overt, immediately serious, and involves the student consciously or subconsciously trying to maintain some semblance of power in an environment that promotes the opposite. Sometimes it looks like students coming to class without their work or talking/acting out while the teacher is lecturing or putting their heads down while they should be participating. Sometimes the student stops showing up. These are all passive aggressive and inappropriate behaviors, but one must wonder what causes them to manifest in the first place. The teacher often feels like she has done all she can do, is at the end of her rope, so to speak. And sometimes she’s lost her end of the rope altogether. 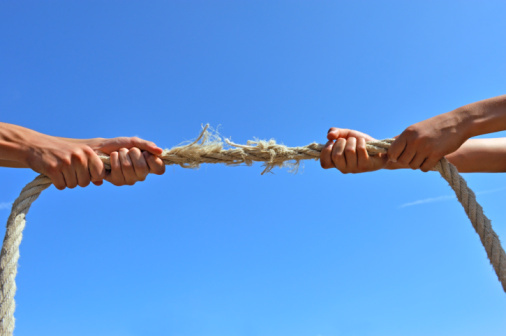 The metaphor of a rope is an appropriate one because the student and teacher are playing tug-of-war, but neither party is winning. This relationship is what I’ll call the “fault/power paradox” of traditional schooling, and the consequences are troubling. According to a study sponsored by America’s Promise Alliance, thirty percent of high school students nationwide drop out; that’s 1.2 million public high school students each year, and the rate is higher in urban areas where nearly fifty percent of high school students drop out (Grey, par. 1-4). This is a complex problem with a variety of causes and solutions, but I’d like to argue that if the fault/power paradox were abolished, we’d see substantial improvement. What is the fault/power paradox? To put it simply, it’s the relationship that students have with their teachers that causes them to believe that they are both at fault for their failure and powerless to improve without the teacher’s intervention. It’s the relationship that tricks students into thinking that teachers have all the answers, not only to what’s going to be on the test, but also the answers to the questions students ask about themselves: Am I any good at this? Do I have any ideas worth contributing? Can I make good decisions about my own life? And it’s the relationship that keeps students from knowing a fundamental truth about themselves: they must ultimately have the power to determine the answers to these questions or else they are giving an outside force – whether it be their parents, teachers, friends, or employers – permission to take that power from them. In reality, it is teachers and the system as a whole who are at fault and who use their borrowed power to convince students, intentionally and unintentionally, to the contrary. I have to slip in a disclaimer here. I’m one of those teachers. I’m not speaking on high as any sort of expert in student empowerment, but rather as someone who has been part of this very system for over ten years, someone who is slowly waking up to find that, as long as I continue to play the part of the faultless, powerful authority figure, I am only teaching my students to depend on me and distrust themselves. For the past seven years, I’ve been teaching college-level writing to students at universities and community colleges, and I’ve witnessed students of all ability levels and walks of life enter my classroom looking for the answer to the wrong question: What do you want? When I ask this question back to them, they’re often not sure how to respond. And when I tell them that I don’t have all of the answers, that I’m only good at this writing stuff because I’ve been practicing it fervently since I was a little kid, that it’s more important for them to make the decisions about what they’ll learn in my class and how (because it’s really their class, not mine), many of them become visibly angry. When I won’t answer questions like how long does this essay have to be, how many sources do I have to use, or how much is this worth toward my final grade; their anger turns to incredulity. How can I not answer such simple questions that teachers have been answering for them since grade school? What kind of teacher am I anyway? I’m the kind of teacher who wants students to learn something besides how to memorize the format for writing a successful college-level essay. I hope to cause them to question me and themselves and all supposed authority figures so that they can become active, consequential citizens in our democracy. I’m the kind of teacher who celebrates mistakes as learning opportunities rather than signs of stupidity or laziness, which is what many of my students have been taught about themselves since they were very small. The fault/power paradox snuffs out feelings of safety, confidence, and a willingness to take risks or make mistakes in both students and teachers (because the teacher is placed in a position of absolute authority and power, which means that she can’t make mistakes, and if she does, she can’t admit to them). Instead, it promotes passivity in students (I’m only going to do what I have to, to get by in this class.) and authoritarianism in teachers (It’s my way or the highway.) And while some students will jump through the hoops, learn the skills, and complete the necessary assignments, even doing well enough to earn a good grade, others will do one of two things: completely tune out because they know better than to buy into this fraud or give up because they do buy into it and have decided that they’re not up to the task. Few of the students in this scenario will become more critical thinkers, supposedly one of the primary goals of education, and many of them will leave just a bit less confident of their ability to make decisions for themselves. The worst outcome that I witness is students who buy into the fault/power paradox so completely that they blame teachers and other authority figures for all of their failures, leaving themselves free of blame but also free of power. Tutoring in the writing center at one community college, I often hear students grumble about how the teacher didn’t explain it well enough or the teacher’s assignments are always confusing or the teacher just doesn’t like me so I always get a bad grade. These students are so engrossed by their battle with the straw man that they don’t have the energy, or the insight, to look at themselves and say, “What might I do to better my circumstances?” They’re focused on the wrong argument. Instead of attacking their teachers, they should be asking themselves how they might take charge of their own learning, where they might find the resources to answer their own questions, and what might make their coursework more personally relevant. As long as they feel powerless, they don’t have to answer these questions. But you know what; teachers need to ask themselves a similar question: “How am I at fault for the negative behaviors I witness in my students?” This is not to say that teachers are to blame for all of their students’ failures. This swings the fault/power pendulum in the wrong direction, assigning fault to teachers where they have little power or control. So it’s understandable that some teachers might look at that question and feel a little defensive. But ultimately teachers do play a role in student success, and to do so fruitfully, we have to strip away the façade of power, form positive relationships with students, and see them as willing participants in their own learning. If we don’t see them that way, students and teachers will continue to have an adversarial relationship with each other, one in which students are just trying to get by and teachers are trying to maintain control. So what’s the solution? As I’m sure you’ve already suspected, there’s not an easy one, but Kohn suggests that there are three ways for teachers to motivate students without using coercive tactics. He calls them the 3 C’s: content, community, and choice. These are classrooms “where students are working with one another in a caring environment to engage with interesting tasks that they have some say in choosing” (Brandt, par. 30). I’ve come to the conclusion that ending the fault/power paradox means giving up some of the control we as teachers have grown accustomed to, whether that be control over our lesson plans or over the ways students interact with us and each other in the classroom, but it also means gaining the opportunity to help students become their best selves, and that seems like a worthwhile exchange to me. Jaime R. Wood is a writer, educator, and co-founder of IncitED: The Crowdfunding Community for Education, www.incited.org. She is passionate about helping teachers and supporters of education bring worthwhile education initiatives to life. « Teach for America: A Terrific Model for Expansion! Wow Jaime, your experiences echo mine so closely. It was as if I wrote this about my high school math failures. Same goes for the teaching component. I too have struggled with the power/fault issue, especially now that we have eLemenT and I am in a position to transfer the authority I had to use in previous teaching positions. I am finding that we relate to each student a bit differently, so it is hard to put our motivation efforts into a formula. We have seen incredible transformations in the teens we have worked with this year, and those 3 C’s are fundamental to our success. In efforts to recruit students, I do find that many parents struggle to trust their teens, and many kids are at first uncomfortable with the power we offer. I am often surprised at the amount of fear and animosity some have at the thought of student-led education. I suppose it is another example of the fault issue. Let’s keep up the good fight for real education reform. Thanks for the great post. Thanks, Lisa! Part of the challenge students and teachers face is relearning what we’re capable of, and sometimes that can be scary. That fear can often come across as defensiveness when people feel like they’re being asked to move outside their comfort zone, but that’s where all the magic happens! Keep up the good work, Lisa! I know you’re making great strides with your students and their families. Great article, Jaime. Thanks very much for sharing!